Running is such an unusual sport in that you can do it all by yourself or with tens of thousands of other people. I have been running in the DC area for over 4 years now, and every day I’m impressed by how large and active people are in this city’s running community. Being a part of a running community not only gives you a sense of identity within the sport, but like any other community, it allows you to learn from each other, push each other, and become better at what you are doing. It is pretty simple, really. To feel more a part of your local running community, go and hang out where the other runners are. Throughout this post you will find 4 simple suggestions on how to do just that. Though all of these example are DC based, the principals really apply to any city. This might sound pretty obvious, but for a lot of people it isn’t. Most runners are either solo runners, logging the long miles out by themselves, or gym runners, who bounce around on the treadmill in a room full of other people silently doing the same thing. While both are great for their own reasons, finding a weekly running group is a great way to meet new people and push yourself with others. DC is loaded with groups that depart from different locations nearly every night of the week. A few of the biggest leave from the many PR Running Stores, Lululemon, Georgetown Running Company, Pacers and City Sports. You can also find several unaffiliated with stores by looking at websites like meetup.com. These groups usually meet at a certain time once or twice a week and split up into different distance groups. Throughout the miles the groups often splinter out into different paces, but you’ll probably never be left alone, which is great for winter evening runs in the dark or for people who like the companionship. In the world of pocket computers and tablets, you no longer need an in-person running community to brag about your killer last mile, vent about that pesky knee pain, or share the awesome new route you just discovered. Sure, many of your friends probably don’t want to see every run you log on Facebook (please don’t be that guy), but other sites are set up for sharing just such achievements. Maybe the most popular such site is dailymile.com. If you are one of the few runners who don’t know it, Daily Mile is a social media site where you can log, map, and describe all of your runs. You can follow other people, send them messages of encouragement, and engage with other runners from around the world. I personally haven’t ever been able to get in the habit of logging my miles like that, so I resort to complaining about how slow I am on twitter! Recently, Rock Creek Runner has officially endorsed the hashtag #RunDC. Just about a month ago there was only one dude using it (@DCRunster), and now the #RunDC community is growing every day. If you are a DC runner with twitter, I can’t encourage you enough to check it out and share your runs. Not from DC? Your city probably has a similar hashtag like #runLA, #runNYC, and #runBOS. Places like these are the perfect for posting what you accomplished, how it felt, or the pic you took along the way. When you want to meet the local painters, you go to the art studio. When you want to meet the local drinkers, you go to the bar. When you want to meet the local runners, you start hanging around a running store. Just like bars and coffee shops back in the day, running stores can be a great place for people to share what they know. Most running store employees are happy to talk shop, whether it is races, shoes, the latest gear, or training tips. They live to run, and want to talk about it. Having a running store that you can go to for injury questions or advice on your next race is an extremely simple way to connect with the community. Stop in, chat for a bit, pick up a few Gus, and you will be part of the group in no time. If you are looking for some good ones to check out. I recommend Pacers, Potomac River Running, and Georgetown Running Company. Hands down, the best way to get involved in your running community is to race your local running community. No matter if you live in a big city or a small one, you can find frequent local races just about anywhere. During the DC summer, the race calendar is jam packed with 8k Twilighters, 5k Friday series, half marathons, and trail races. By joining in on these small locally organized races, you’ll start to see the same people over and over, and you will automatically have something to talk to them about. Sign up for a run by yourself? No problem, I do it all the time! After the race just find that guy or girl you were pacing with for a few miles and congratulate him or her on a run well done. More than likely you will start to chat about how it went, and you just might have found your next running partner. I ran the Ex2 Adventures Fall Back Yard Burn 10 mile trail series last fall. During the first race (of 5), I ended up pacing the last 4 miles with another runner. After the race we struck up a conversation, and by the end of the series we were looking for each other at the starting line before each race. I ran every single race with that person and we pushed each other harder and harder each time. It was great! No Partisan Politics in DC (Running)! Not everyone wants or needs to be a part of their running community. For so many runners, it is 100% personal and that is the way they like it. For most of us, the more we practice it, read about it, and talk about it, the better runners we become. 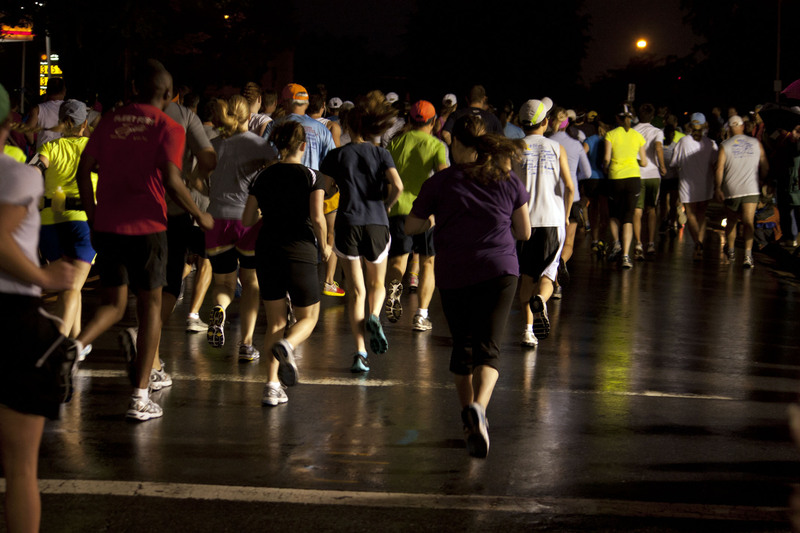 The DC running community is full of welcoming people ready to adopt anyone willing to join. Go out there, find your group, race, store, or hashtag, and share your runs! P.S. It never hurts to read and comment on your local running blogs either. 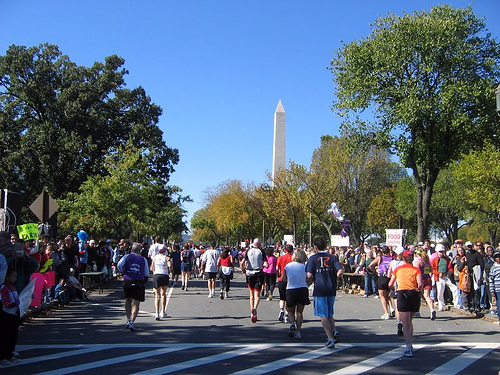 If you are looking for more info on running in Washington, DC, be sure to check out the ultimate Runner’s Guide to Washington, DC. I applaud your bold decision to officially endorse the hashtag #RunDC. Thanks for this post! I’m moving to DC soon and am kind of panicking about leaving the wonderful NYC running community behind (including my team)! I’ll definitely be checking out a bunch of those weekly group runs from the running stores, especially as winter approaches and it starts to get dark early.